Close Your Eyes is the perfect book for reading to a child before bed. 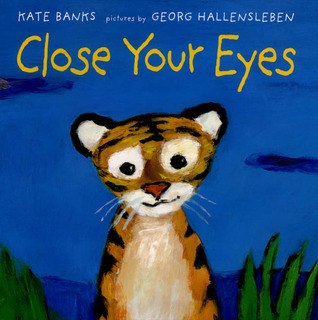 The book is about a tiger who tells her kit to close his eyes and go to sleep. The little tiger doesn’t want to go sleep because of all the things he will miss, and he is afraid of the dark. His mother gently reminds him of all the things he can see in his dreams, and that he has no need to fear because she is near. This is a sweet children’s book. The illustrations by Georg Hallensleben are wonderful. They use loads of color, and they have a little dreamy quality which is perfect for a children’s book. The message of the book is also sweet. That a child doesn’t have to miss out on life during their sleep, they are just experiencing it in another way. For all of you with children, check this book out.